John McWhirter brings down a man mountain. Newton Stewart RFC travelled to Irvine for their first away match of the 2016-2017 season in BT West Division 1 coming home with a 13-10 win. Irvine are new opponents to the league this year, having been demoted from the league above at the end of last season. The Reds would go into this match feeling positive after securing a win in the opening game of the season the week before, but aware of the substantial task ahead. Irvine kicked off the game in overcast but dry conditions. Collecting the ball, Newton Stewart immediately looked to put some pressure on their opposition. Running some strong attacking lines, they were quickly penalised by the referee for crossing. The whistle would become a frustratingly common theme in the match as the referee refused to let the game flow. Irvine kicked the ball to touch before securing it again at the subsequent line out. Keen to make some progress of their own, their play was halted by back row David Montgomery who ripped the ball from his opposite man before sending second row Jason McKie running up the left wing. He was bowled into touch to bring an end to the early exchanges. A spell of scrappy play followed with neither team able to hold onto the ball for long. Both sides were hindered and frustrated by the referee’s excessive use of his whistle. Irvine enjoyed a more consistent period of possession now, the first real test for Newton Stewart’s defensive line who stood firm. The threat ended with an Irvine knock-on. The Reds now came on the attack and pushed forward. An Irvine infringement in contact resulted in the referee awarding Newton Stewart a penalty within kicking distance. Stand-off Jame Muir slotted the ball over to secure the opening points of the game after 15 minutes. Another penalty for Newton Stewart came shortly after, however Muir couldn’t convert this one, an unusual miss for the in form player. The remainder of the first half was mainly dominated by the Reds. They tried to cut lines through the Irvine defence, but their opponents were physical in their defence and would not give away any easy points. The referee continued to to play his roll in the game when he handed out his first yellow card of the game to Irvine for a late tackle on prop Martin Wallace. Using their numbers advantage to force their opponents down field, Newton Stewart were awarded another penalty within range for Muir. This one was on target and the Reds stretched their lead to six points. With the last attack of the first half Newton Stewart showed some of their most impressive play with slick passing and confident running, each man aware of the position of his team-mates. An interception from an Irvine back disrupted what would have been a certain try for centre Liam Brawls to finish the half. After the break the play was particularly splintered by the referee’s interruptions. Newton Stewart scrum-half Robbie McCornick was sin-binned first for some over-zealous use of his feet at the ruck. Less than a minute later Thomas MacDonald suffered the same punishment for a dangerous tackle. With their opponents reduced to thirteen players, Irvine sensed a chance to grab some points. Pressurising the stretched Red line, the home team eventually found a way through to score in the far corner. The conversion attempt went wide, 5-6. Newton Stewart were under pressure but rose to the challenge up front with a huge physical effort. Some solid scrummaging kept Irvine at bay and gave Newton Stewart some unexpected possession despite the mismatch in numbers. Backs Liam Brawls and Mark McCornick galloped up the park, stretching the the Irvine line, but a knock-on in the offload ended the move. Handing out his fourth yellow card of the game, another Irvine player was dismissed for shoulder barging into the side of a ruck. Robbie McCornick returned to the game, closely followed by Thomas MacDonald, and Newton Stewart now found themselves with the extra man. With belief that the score was coming and carefully controlling their discipline to avoid any further cards, the Reds started pressing on the Irvine try line. 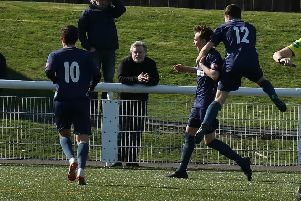 A penalty against Irvine for off-side gave Newton Stewart the opportunity they had been looking for and Montgomery was able to crash over the line from close range. Muir converted to make the scoreline a more comfortable 5-13. The Reds kept hammering away at the Irvine line, forcing some desperate defence from Irvine which ended with a fifth and final yellow card for a high tackle. A scrappy spell followed where Newton Stewart’s discipline was lacking. Sent back twenty yards for not retreating ten the first time, the home team found themselves with an opportunity to push the ball over the line in a rolling maul to to score in the right corner. Once again the conversion was lacking and the gap narrowed to 10-13 with ten minutes to play. Irvine sensed the opportunity for a late steal and began to pile the pressure onto Newton Stewart. Playing some of their best rugby of the game, the Irvine backs finally had a chance to stretch their legs. With their winger running up the left touch line at pace, a flying covering tackle from Montgomery saved the Reds from losing another try and the game in the dying minutes. An eventual knock-on from Irvine ended an extremely tense game with Newton Stewart victorious. This was a difficult game for the Reds - Irvine were physical opponents and used the ball well when the referee allowed it. Special mention to winger John McWhirter for his ferocious tackling, easily felling a man well over twice his weight and size. Liam Brawls was also solid in defence and ran some good attacking lines when the opportunity presented itself. Man of the match however has to be David Montgomery. A constant threat with the ball in hand, he scored Newton Stewart’s only try of the day and secured the win at the last with his try-saving tackle. The Reds are at home next weekend to Kilmarnock RFC to continue their campaign. Kick-off is at 3pm.